Dawn Furline and Pete Woodward, U.G. White General Mercantile manager, accepts the 2012 Cider Cup for the winning recipe at the Sippin’ Cider Festival. 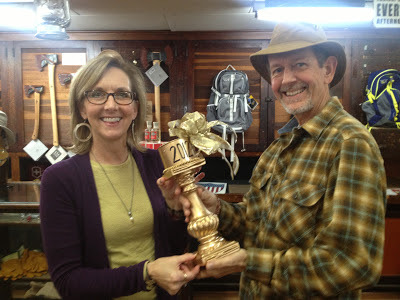 Second place winner with less than a point difference was CEI Books, followed by Crawford’s Gifts in third place. 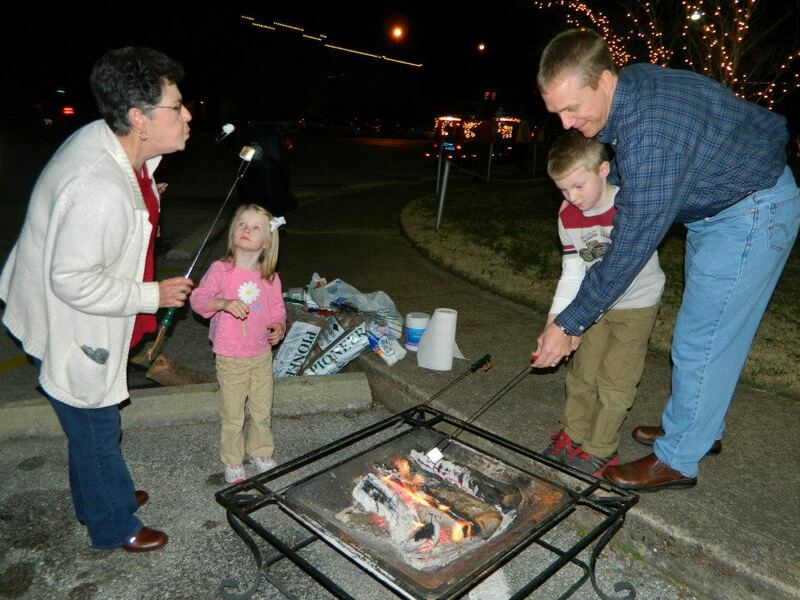 The second annual Sippin’ Cider Festival which was held in Downtown Athens on December 8, 2012 and was sponsored by Spirit of Athens and Limestone Chapel Funeral Home. Attendees were able to shop from 5-8 PM in participating businesses, take advantage of store specials, and rate the cider in each business. Those customers that voted on at least five recipes were entered into win a door prize donated by each business. Door prize winners are; Jack Warner of Athens won Luvici’s shirt and bottle of Big Jim's bbq sauce, Tyler Coggin of Gurley, a frame from Trinity’s, Alice Whitt of Rogersville, Scarves from Bennett's Clothing, Julie Shelton of Athens, won a necklace set from Claborn Specialties, Dwight Billions of Athens, Frame from Pimentos, Pam Hester of Athens, a Village Pizza certificate for a free large one topping pizza, Peggy Wright, Melissa & Doug toys from Belles and Beaus, Clint Coggin of Madison, Pablos on Market $15 gift certificate, Jonathan Colwell of Athens, Case knife from U.G. White General Mercantile, Brenda Jackson of Athens, CEI Books’ Tote filled with holiday items, and Davidson Crooks of Athens, Gray & Holt $25 gift certificate. Entertainment during Sippin’ Cider included a live performance by Trey Morgan, train rides by the Athens Lions Club, visit from Santa, appearance by Scrooge and Dickens characters, marshmallow roasting fire pit and children’s crafts. The third annual Sippin’ Cider Festival will be held on December 14, 2013. 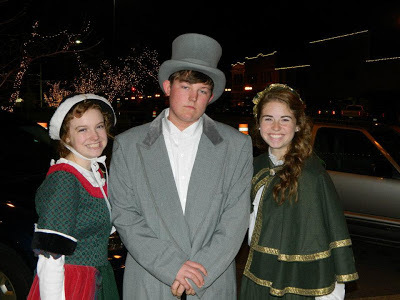 Kathyrn Flynn, Mac McAlister and Miranda Hudleston, members of the Mayor's Youth Commission, dress up as Dicken's characters.